If you’re craving seafood, this healthy baked salmon doesn’t get easier than this. 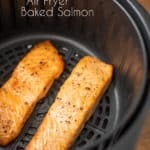 Air fryer baked salmon in the air fryer is truly a quick and easy dinner. 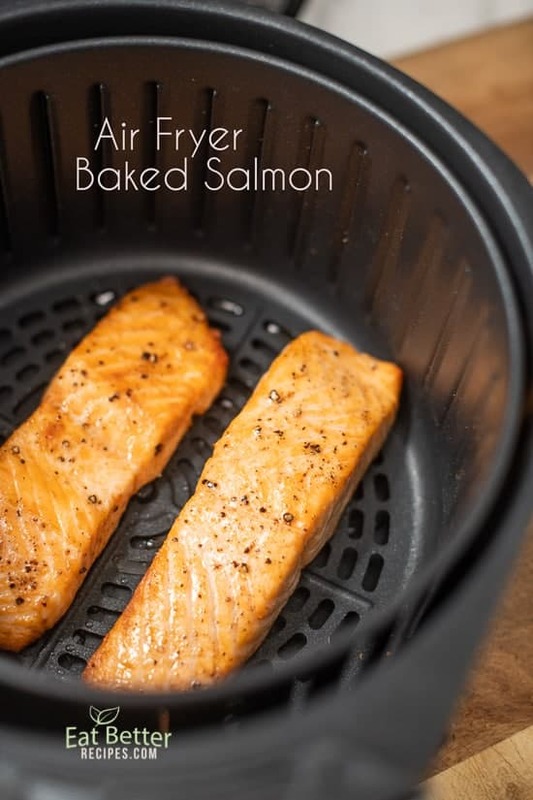 How to Bake Healthy Salmon in the Air Fryer? It’s truly super easy to make salmon in the air fryer without a bunch of fuss. All you need to do is lightly coat the salmon with olive oil, then season with salt and pepper. You barely need any oil or grease at all and that’s what makes cooking salmon in the air fryer so wonderful. The salmon comes out perfect every time. The hot air circulates evenly around the food, giving the food a wonderful crispy texture that’s like roasted without all the oil. Air fried foods is much healthier too because you don’t need as much oil! That’s the wonderful reason to cook with air fryers. It gives such a great texture similar to deep frying, but with all the greasy oil. There’s less mess too. If you’re frying foods, you have grease to dispose of and mess to clean up. 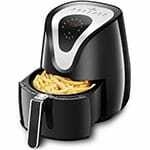 But in the air fryer, you don’t have all those issues and best of all, there’s less odor! 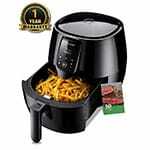 Tidylife 4.2QT Air Fryer – Texture for several dishes came out noticeably better than other brands. This one tends to cook a little hotter and quicker. NuWave Brio 3 qt. 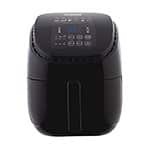 Digital Air Fryer – This NuWave Air Fryer is great too and it’s our second favorite. The basket has wire base (which we found sticks a bit more) and it doesn’t have the 1/2 way reminder beep of the some other brands, however still cooks great. This NuWave model has a lower temperature capability, which can give you more cooking options for foods that need lower temperatures. The lower temperature feature might be great for proofing breads! Oster Copper-Infused DuraCeramic 3.3 qt. 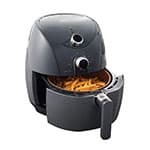 Air Fryer – We love the copper infused ceramic coating on the basket and it good great. The knobs are easy to use and overall functionality is great. Plus, if you’re familiar with the Oster brand, they’re reliable and not too expensive. Crispy Brussels Sprouts with Balsamic Vinegar Recipe – Amazing! Homemade Crispy Air Fried French Fries with barely any oil– Wow! Coat salmon with lightly oil or cooking spray. Season both sides of salmon with salt and pepper. Place salmon in basket. Air fry the salmon at 360°F for about 10 minutes or until cooked to your preferred texture. Check the salmon with a fork to make sure it's cooked the way you like it. Don’t crowd the basket. 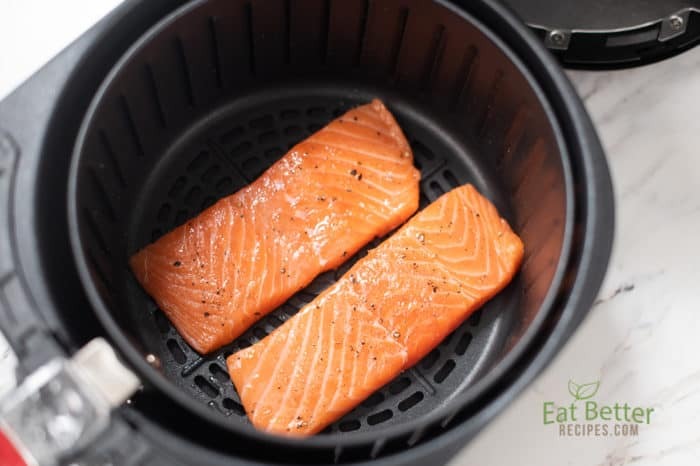 If you decide to double the recipe, it will work great but make sure your air fryer is large enough to fit more of salmon filets (we cooked this recipe in 3-4qt air fryers). You might need add an additional 1-2 minutes of cooking time to make sure the salmon is cooked through if cooking in a crowded basket. If using a larger air fryer, the recipe might cook quicker so adjust cooking time. This was awesome. The salmon had a great crust and was still juicy in the center. Can’t believe it came out of an air fryer. Thanks for the recipe. Hi Morgan, so glad you enjoyed it! Love the air fryer! So savory and very easy to do. This is a great way to introduce salmon to my kids. That’s awesome that your kids are eating healthy salmon! I just got an air fryer for Christmas and I love it! Have made chicken breasts and lean hamburgers. We want to try salmon in it but I’m worried the exhaust will stink up the whole house. Have you had that happen or does it cook pretty much smoke free? I am anxious to try your recipe. 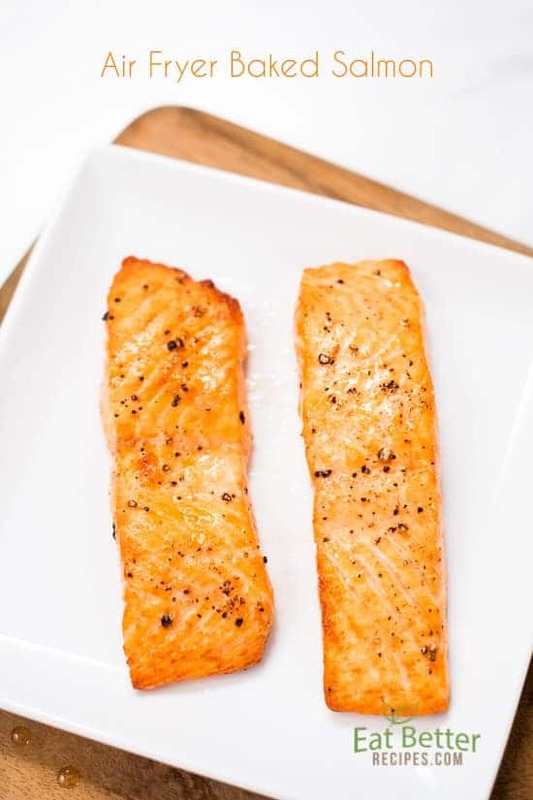 We love the simplicity of it, just salmon and not a lot of extra flavors and calories. Thank you! Congrats on the new air fryer! There will definitely be a smell so we suggest having the exhaust on high and buying the freshest salmon possible! This is my second time making this recipe and it’s so quick and easy. Next time I’m going to try tilapia! Any suggestions how timing? Tilapia is usually little thinner, so cut back the cooking time by about 3 minutes. Then keep checking to make sure it’s to your desired texture. Glad you’re enjoying the recipe! I barely used any oil and the salmon came out perfect. It’s so much quicker and better than baking it in the oven. We love baking in the air fryer better than the oven too! Fantastic recipe and so easy! I added some broccoli and cooked both the salmon and the vegetable together. Instant dinner! We do the same thing! We like to add cauliflower too and it’s a quick and easy healthy salmon dinner.